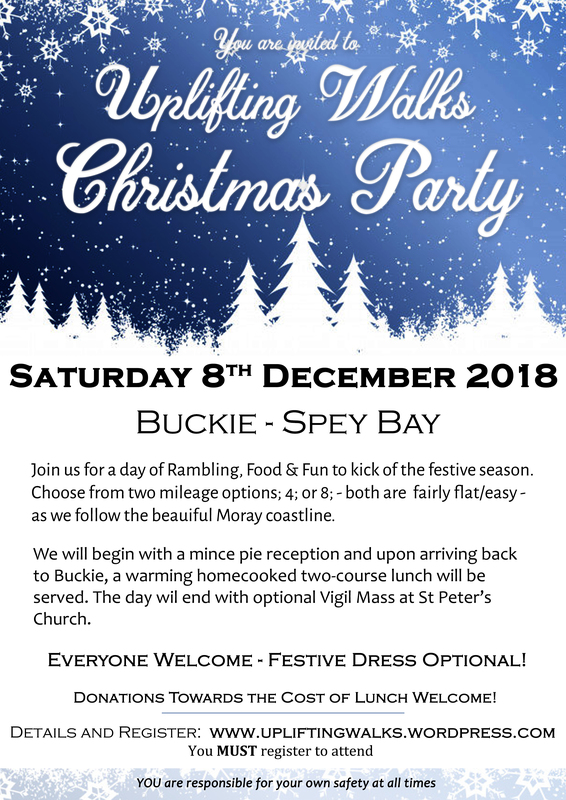 A welcome festive treat will begin our walk and upon our arrival back to Buckie, a warming home-cooked two-course lunch will be served (no need to bring food!). The day ends with Vigil Mass at St Peter’s Church (optional). Festive mid-point treat break (provided). Either: continue to walk to St Peter’s (extra 1.5 miles) or meet back at St Peter’s using car/public transport. Following the Speyside Way to Spey Bay Golf Course, then taking the coastal route back to Buckie. The walk will be accompanied by flowing conversation, festive fun, beautiful scenery and possible wildlife sightings including seal, birds and if very lucky dolphins. All options will include coastal paths and old dismantled railways which makes for a general simple walk. Food Requirements: 2 Course Lunch Supplied! Donations towards the cost of food will be gratefully received. Car Parking: There is a car parking at St Peter’s Church, St Andrew’s Square, Buckie. Public Transport: The 35 service between Aberdeen and Elgin runs though Buckie. If travelling from Inverness direction take the 10 service (or train) to Elgin, then catch the 35/38. There is no train service to Buckie.